The Earl of Eglinton, after a short residence on the continent, instead of proceeding to India, has gone to Algiers, where he spent part of the winter last year. In aid of the Outram National Miners’ Fund, the Ardrossan and Saltcoats Players’ gave a dramatic entertainment in the Pavilion, Troon. There was a crowded audience. Three plays were presented – “A Well-Remembered Voice,” by Sir J. M. Barrie; “The Bailie’s Nominee,” by David Martin; and “The Old Lady Shows Her Medals,” by Sir J. M. Barrie. “A Well-Remembered Voice” has been selected by the Players for this year’s drama festival. The plays were produced and personally directed by Mr. James T. Woodburn. The Pavilion Orchestra provided incidental music. March 3, 1960. ... The date was March 3rd, 1960. The place was Prestwick Airport in Scotland. 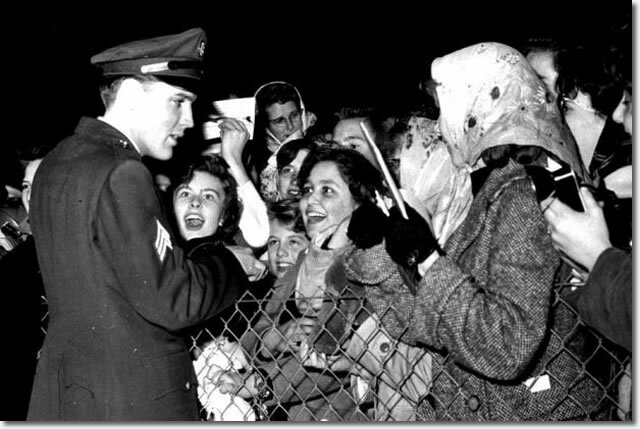 Elvis was finishing his American army national service and stopped over in Ayrshire for a precious two hours. In those days, Prestwick was home for the 1631 USAF unit. The inspection of the 1st Largs Company Boys’ Brigade took place on Friday night, Major Emslie, Ardrossan, being inspecting officer. The British ship Christina Dawn (300 tons), loaded with carbide, which has been ashore for 11 days at the mouth of Irvine Harbour, Ayrshire, blew up early to-day with an explosion which shook towns for miles around. No-one was on board. The crew were due to board her only two hours later. All that remained of the ship was a smoking hulk, with decks and sides split and the sea washing into a gaping hole in the hull. Irvine harbour has been closed to shipping for 24 hours because of the danger of further explosions. The Christina Dawn, which arrived from Port Talbot on April 3. was blown ashore when approaching the harbour bar. With flames shooting from the ship at 6-30 a m., the explosion shook Irvine, and eight miles away the Troon lifeboat crew turned out believing it was a signal maroon. A harbour official said that the crew and salvage men were due go on board in a couple hours in an attempt to get the ship off. The ship, a coaster, was commanded by Skipper O. J Owen, and is owned by the I. P. Langford Shipping Company, Gloucester. In addition to the information provided above, the Glasgow Herald reported, ".....firemen kept watch on the sandhills of Ardeer, where special arrangements were taken to protect explosives magazines." Just noticed Malky McCormick passed away a week or so ago. An official inquiry was held yesterday at Troon with regard to the stranding of the steamship NAVARRA, of Glasgow, on the Black Rocks, a reef about half a mile in length, which separates Troon Bay from Prestwick Bay, and which is almost completely under water at high tide. The NAVARRA had arrived at Ayr on Monday morning, 31st March last, with a cargo of iron ore from Santander, and after discharging cargo had, at about 9.50 p.m. of Tuesday, 1 April, left Ayr for Ardrossan. The Court meets at ten o’clock today, and it was intimated that judgment would be given at one o’clock. The Court met yesterday at Troon to consider the evidence given on Tuesday in the inquiry with regard to the sinking of the Glasgow steamship NAVARRA on the black rocks between Troon and Ayr, on 1 April current……….The Court found that the master, DAVID BOOTH, was alone in default for such stranding, and suspended his certificate.